With so many horrible events that occurred this week it was hard to focus on “favorites”. But if anything positive came out of this week, it was thoughts of gratitude. Feeling thankful for everything I have in my life. Appreciating both the big and little things. We went to Boston for the weekend to visit some friends from Montana who were there to run the Boston Marathon. She is one of my oldest friends; we’ve known each other since 6th grade. We’ve been through a lot together – middle school, high school, college, studying abroad in Europe together, and she stood by my side on my wedding day. She was there with her husband, who ran the Marathon on Monday. We couldn’t stay for the actual marathon. Hubby had an important meeting at work on Monday otherwise we would have been there in a heartbeat. That was the first time in my life I was happy to have had to cut a trip short due to his job! Memories of the weekend, however, remain entirely positive. 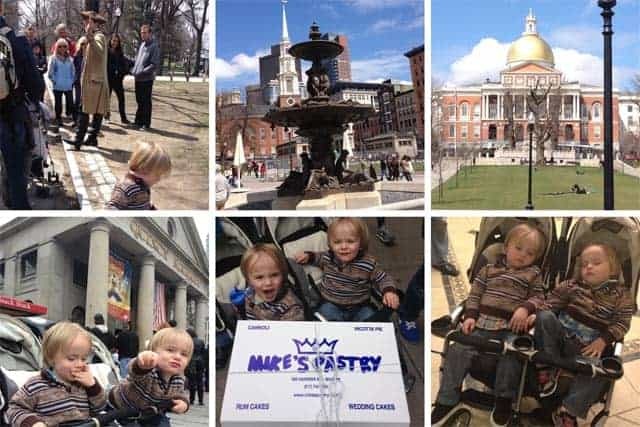 We spent all of Saturday downtown, starting in Boston Commons, then working our way to the North End, devouring pastries from Mike’s Pastry, then working our way along the waterfront back down to our car. After four hours of walking we were hungry, and needed a family friendly restaurant to eat at. Fiorella’s came highly recommended. Perfect for the kids, and equally perfect for the hungry adults with their delicious Neapolitan style pizzas. Ps. Their marinara sauce is to die for! We left Boston on Sunday afternoon, but our friends stayed for the race. Out of everything I am thankful this week, what tops the list is that my friend is a crazy fast runner, finishing the marathon in less than 3 ½ hours, so he was able to reunite with his wife and escape the finish line madness before it all happened. They are now safely back home in Montana. 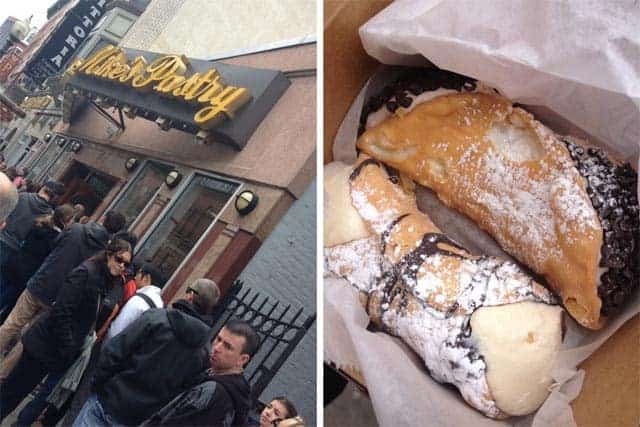 Crazy good Cannoli from the famous Mike’s Pastry in Boston. 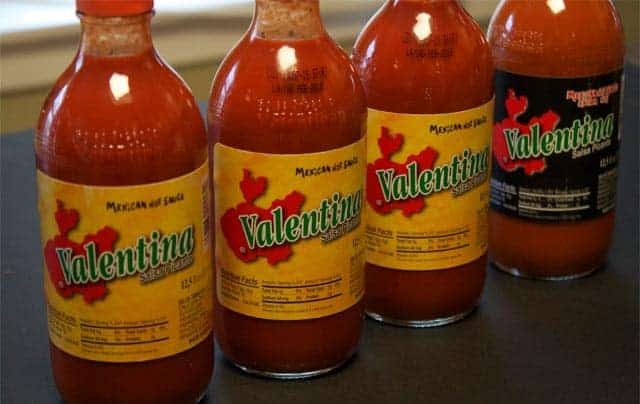 Valentina — My favorite hot sauce! Another piece of exciting news is that my mom is visiting from Arizona for the next two weeks. I can’t decide what I am most happy about — the fact that she is here, or that she brought me four bottles of my favorite hot sauce (that I can’t find in Connecticut)! She has also promise to teach me how to make her famous red chili sauce… stay tuned! I haven’t spent time with my mom since last fall, so I intend to take full advantage of my time with her. 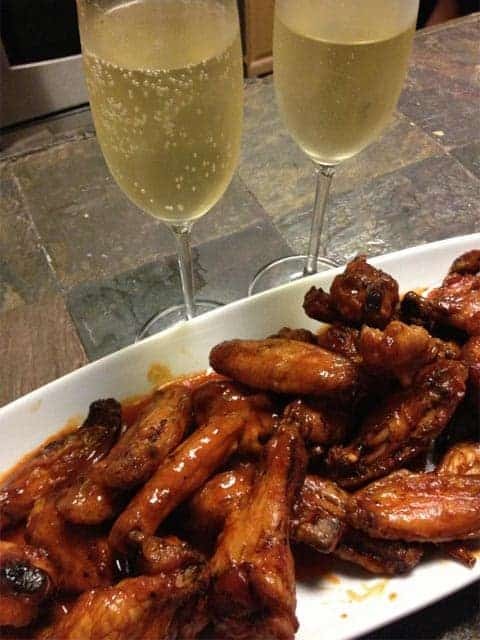 After the events on Monday we decided to indulge on Tuesday night with two of our favorite comfort foods – Bubbles and Smoked Chicken Wings (cooked on the smoker, not fried). I’m pretty sure we’ve finally perfected our recipe for the wings, so expect to see them here soon. The events in Boston this past Monday affected all of us in different ways. Though I don’t consider myself an avid marathoner, I am a runner and have experienced the exhilaration, pride, and range of emotions involved in training for and running a marathon. Boston is the epitome of that experience for many athletes. That feeling can’t be taken away. 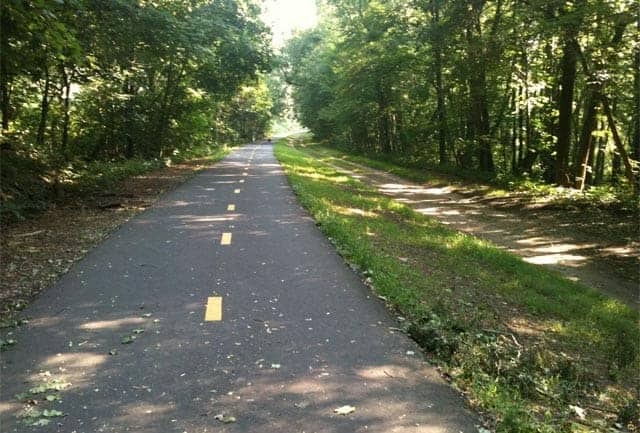 One of the things I feel after this week is my appreciation and love for running, and an urge to get more involved in the running community here. The Hartford Marathon Foundation has a comprehensive website full of running events throughout the year. If you have ever wanted to run and just don’t know where to start, look to your states biggest marathon, and search their website to see what smaller events they may be associated with. Most importantly, start running! I’m already searching for a half marathon to run this summer. I’m eyeballing the Oregon Wine Country Half Marathon. Perfect excuse to travel back to Oregon to visit good friends and (of course) visit some of my favorite wineries! Any other favorite half marathons I should look into?? I don’t get very excited about under $10 wines too often. Usually the best of them are just doing their job at being tasty everyday value options — uncomplicated, yet tasty and easy drinking. This wine, however, was an exception. I received this wine as a media sample for #MalbecWorldDay this past Wednesday and tasted it alongside two other Malbecs from Argentina. This one stood out above the others, by a lot. It was very smooth, with lavender, vanilla, and dark lush blackberry fruit and well-balanced for a $10 Malbec. In this price point I typically tend to find most Malbecs to be thick and gritty and was surprised how balanced and smooth this wine was. A wine definitely worth checking out, especially as grilling season approaches. It would be great pair for burgers or flank steak. On top of it I received two of Riedel’s newest wine glasses, The Malbec Glass, to taste the wines from. Admittedly, I am quite a stemware snob. Not that I need to drink each wine from its accompanying glass. I don’t. But I do prefer to drink wine out of a quality glass. Riedel leads the way with their stemware, and Graffigna commissioned the company to come up with the design specifically for Malbec and has a one-year exclusive to use and sell it. In order to see if stemware actually made a difference I tasted the same wines in several different glasses and what I noticed was that the fruit expressed itself the best with the Malbec glass. The fruit was muted when tasted from a Pinot Noir Glass, and similar results when tasted out of a smaller White Wine Glass and even the larger Bordeaux Glass. I tasted different Malbecs from this glass for three days in a row, and I can attest that it really did make a positive difference in the taste (and especially aromas) of the wines. I intend to continue experimenting with these new glasses throughout the next few weeks. I received the Graffigna Malbec and the stemware as samples, but my opinions are entirely my own. The wine is widely available and retails between $8-$12. 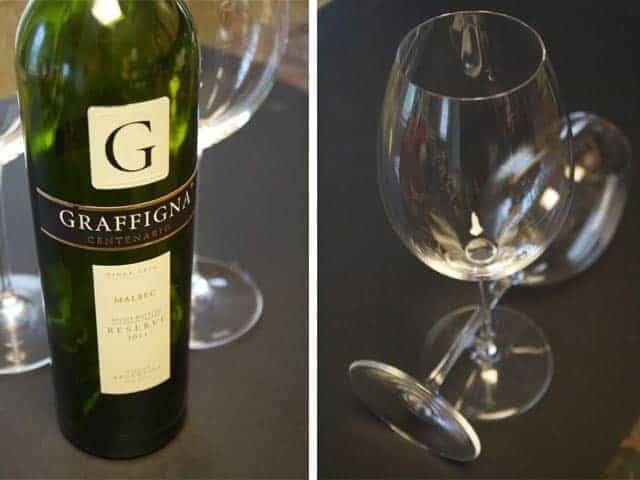 For now you can only purchase the glasses from Graffigna’s website — currently 6 for approx $60 plus shipping (which is a pretty good deal for this level of quality glass). Just to compare, the Target line of basic Riedel glasses sell 4 for $40 (so same price per glass). Want more? If you liked what you read you can subscribe to Vindulge and have it delivered directly to your inbox.